I lead a smooth, flowing, mindful yoga class. This is a wonderful introduction to yoga, or a great weekly practice for those already enjoying the benefits of yoga. A simple yoga practice gently moves and stretches your body for a healthy posture and improved flexibility. Deep breathing exercises help to calm and rejuvenate the mind. An atmosphere of peace and tranquillity will lift the spirit, and release stress, while you are soothingly led through each movement. A simple morning yoga practice will wake your body and freshen your mind giving you a big spark of energy to move into the rest of your day. Great for all levels of experience. 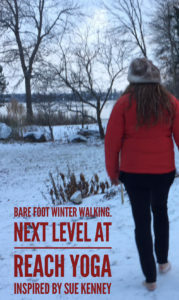 If you don’t yet know, we have a Bare Foot Walking Club at Reach Yoga goes outside, barefoot every Saturday morning after yoga in Guildwood. We go out barefoot and do a little walk, a little yoga, a little breathing and a lot of connecting to the healing properties of the natural world. Inspired by the Sue Kenney, Author of the book How to wear bare feet.